"The developments in the regional and international arenas make it necessary for Syria and Iraq to take all procedures to preserve their sovereignty and independent decision in the face of the schemes of division and chaos plotted by the enemies of the two countries. The Syrian-Iraqi Cooperation serves the interests of the peoples of the two countries and is necessary to completely eliminate terrorism hotbed. " H.E. President Bashar Al-Assad upon receiving the visiting Iraqi National Security Adviser Faleh al-Fayyad, April 14, 2019. "Syria's strong relation with both Iran and Iraq has been enhanced further during the war on terrorism and its backers in which the blood of the Syrian hero soldiers was mixed with that of the Iranian and Iraqi soldiers. The meeting, for the principles, mainly dignity and honor, which distinguish our peoples and of which we are proud, proves that Syria, Iran and Iraq are in the same battle and trench against the same enemy." H.E. President Bashar Al-Assad during his meeting with the Chief of the General Staff of the Iranian Armed Forces, Major General Mohammad Baqeri, and the Chief of Staff of the Iraqi Army, Lieutenant General Othman al-Ghanmi, in presence of the Syrian Defense Minister, Gen. Ali Abdullah Ayyoub, March 18, 2019. "… the will of the People to preserve the sovereignty of their countries has been stronger than foreign plots and schemes, given the restoration of stability and security to most of the Syrian and Iraqi Cities." H.E. President Bashar Al-Assad upon receiving a message from the Iraqi Premier, handed over by Mr. Faleh Al-Fyadh, the Iraqi National Security Advisor, December 29, 2018. ''…the victories achieved over terrorism in Syria and Iraq are common victories for the two countries which have been fighting terrorists in a joint battlefield where the blood of the Syrian and Iraqi heroes, who made these victories, was mixed together. Despite difficult security conditions in both countries and the foreign plots to hinder the progress of bilateral relations, coordination at all levels between the two countries has never stopped and there has been mutual understanding of what is going on in the region and the world." H.E. President Assad upon receiving the visiting Iraqi Foreign Minister Ibrahim al-Jaafari, October 15, 2018. "Whatever achievements the Syrian and Iraqi armies in the fight against terrorism is an important step to achieve stability and security for the Syria and Iraq, because the enemy is common and the battle is one against the schemes as to weaken and dismember the countries of the region through the tools of the terrorist organizations." From President Assad's statements, May 18, 2017. "In order to talk about somethng realistic, I would give you an example. We were asked to side with the West, with the United States in particular, in 2003, in its war against Iraq. We knew that the Iraq war was a series of events aiming at partitioning the region, and we knew very well that the conferences which were held before the war in order to define the future of post-war Iraq, all discussed a future sectarian Iraq, and not a unified Iraq. So, we knew that what was happening in Iraq will be carried over to Syria and to the whole region. Had we taken part in such a project at that time, the situation in Syria would have been much worse than if we had refused to do so. That’s why I used to say that the price for rejection or resistance is much less than the price of submission and surrender. I said this many times in the past, and the events in Syria came to prove this argument. What helped Syria to stand fast today is that it is unified. Had we gone along with the sectarian project, following the Iraqi or Lebanese model, as the Americans wanted us to do then, we would have been a country torn by a real civil war. Civil war would have been a reality, not merely a term used to describe what’s going on." "We are defending our country against the terrorists that have been invading Syria as proxies to other countries. So, if you want to go back to that word, the “war criminal,” I think the first one who should be tried under that title are the Western officials; starting with George Bush who invaded Iraq without any mandate from the Security Council. Second, Cameron and Sarkozy who invaded and destroyed Libya without mandate from the Security Council. Third, the Western officials who are supporting the terrorists during the last five years in Syria, either by providing them with political umbrella, or supporting them directly with armaments, or implementing embargo on the Syrian people that has led to the killing of thousands of Syrian civilians." "The truth is that ISIS was created in Iraq in 2006. It was the United States which occupied Iraq, not Syria. Abu Bakr al-Baghdadi was in American prisons, not in Syrian prisons. So, who created ISIS, Syria or the United States?" From President Al-Assad's interview with the French 'Paris Match Magazine, December 4, 2014. "the stance of Iraq is objective and truthful, hence the danger looming over Syria looms over Iraq too." "What has the world achieved from the wars in Iraq and other places?" From H.E. President Al-Assad's Le Figaro Interview September 3, 2013. "It is for this reason that we are observing carefully the unfolding events in Iraq - they will affect us directly. This was also for this reason that we adamantly opposed the war on Iraq, despite a mixture of American temptations and threats at the time. We rejected losing our stability in return for appeasing the Americans. Sectarian systems are dangerous and that is why we insist on the secular model where all citizens are equal regardless of religion." From H.E. President Bashar Al-Assad ‘s Interview with the German Frankfurter Allgemeine Zeitung newspaper June 17,2013. "Iraq which played a very active role in supporting Syria during the crisis because it is a neighboring country and they understand and recognize that if you have a war inside Syria you will have war in the neighboring countries including Iraq." From H.E. President Bashar Al-Assad's RT TV Interview , November 9 , 2012. "Has the Arab league been able to prevent the partition of Sudan or prevent the killing of over a million Iraqis or feed a single starved Somali?" From H.E. 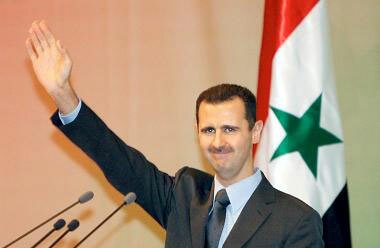 President Al-Assad's 2012 Speech at Damascus University. "I remind you of the “domino effect” term which was used after the invasion of Iraq when the United States assumed then under the former administration that the Arab countries are domino blocks and the American projects will hit just one of these blocks and the others will fall. What happened is the exact opposite when their projects turned into domino blocks, we hit them and they started to fall one after another. This one will fall too." From President Bashar Al-Assad's a Speech at the People's Assembly March 30, 2011. "If you want to talk about stability in Iraq, I am the one who is interested in having stability in Iraq more than the U.S. because it is my neighborhood. If I do not help Iraq to have stability, I am shooting myself in the foot. Second, if they say they need peace in the Middle East, I am the one who is interested in having peace because then I will have prosperity, openness and a flourishing economy." From President Al-Assad Interview with Wall Street Journal, January 31, 2011. "Normally I cannot control my border with Iraq for example. I am having smuggling of armaments from Iraq; this is a normal situation in the region as long as you do not have stability in the region, you will have this sort of thing. Smuggling is something normal and nobody can control it even if you put an army on the borders you cannot control it." "Normally I cannot control my border with Iraq for example. I am having smuggling of armaments from Iraq; this is a normal situation in the region as long as you do not have stability in the region, you will have this sort of thing. Smuggling is something normal and nobody can control it even if you put an army on the borders you cannot control it. So, again deal with the main issue, the peace process, this is where we can solve everything at once; you do not have to deal with every small problem, and it is like mercury you cannot catch it." ''The Syrian vision since the Iraqi elections ended was that Syria should build good relations with all Iraqi sides for two reasons: the first is because Syria wants good relations with the next Iraqi government, no matter what government it is. The second reasons is that if Syria wants to help the Iraqis if they so desire, it must have good relations with all sides. It's not possible to play a positive role in Iraq if relations are good with one side and bad with the other. That is why we say that the problem isn't about who will head the government… the main problem is how the government will be formed, what kind of national government that includes all forces, and what is the national unity government's program regarding Iraq's stability, the withdrawal of foreign forces, and relations with the neighboring countries, and before these points what is its program towards the relation between Iraqi forces in the political arena… In turn, the national unity government must translate its composition into national unity on the popular level,"
''Definitely, to discuss this topic does not mean that we, as Iraq's neighboring countries, Syria, Turkey or others, are speaking on behalf of the Iraqis. The work and decision remain for the Iraqis''. "The sectarian situation is enough for this concern … the sectarian or ethnic division… this situation is a reality in Iraq after the measures taken there following the US occupation… this occupation has never supported any Iraqi political process which we wish to begin with the elections that has recently taken place." "From the beginning, when elections were held, we directly in Syria decided to separate between our disagreement with the Iraqi government and the elections and procedures that will be made to form the government. What is important for Syria in the first place is an Iraqi government that works for the unity, stability and sovereignty of Iraq, on the one hand. On the other hand, the Iraqi government should improve relations with the neighboring countries including Syria." "After elections, communications started between us and the List of Law State headed by al-Maliki. There was transparent talk about the previous stage of disagreement during the past year, as Syria was accused of supporting terrorists in Iraq. Mistakes were clarified. This is why we do not link between disagreements with the previous government and elections. Now, relations have become normal with all parities, the Iraqi list, List of Coalition and the List of Law State. In conclusion, we want good relations with all." 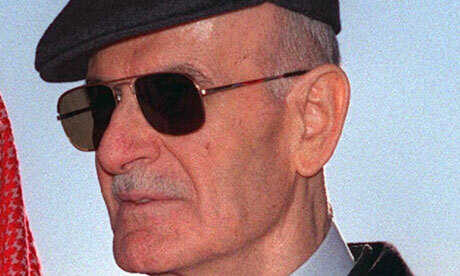 "Regarding Iraq, viewpoints were in agreement on the next Iraqi government which has two tasks: Uniting all the Iraqis in order to restore Iraq's natural role, which naturally means ending the occupation, and the second point is that this government must be able to build good relations with Iraq neighboring countries." "The Americans, simply, do not know what is going on in Iraq. In Iraq there is no vision until now on what is the solution in Iraq, there is no awareness of what is going on and we talk with them but the worst thing is connected with the security aspects. The borders can only be controlled by two parties but if there is not other party, how can you evaluate the border control process…"
"We do not replace the Palestinians , we stand with the Palestinian and that means they should take their own decision and determine their direction and we extend help, but the solution will not come from Syria nor from Egypt Saudi Arabia , or from any other state. If the solution doesn't come from the Palestinian arena, then we all will fail in any role we play…"
They [American officials] only talk about the borders; this is a very narrow-minded way. But we said yes. We said yes—and, you know, during Bush we used to say no, but when Mitchell came [as Obama’s envoy] I said O.K.… I told Mitchell by saying this is the first step and when find something positive from the American side we move to the next level…. We sent our delegation to the borders and [the Iraqis] did not come. Of course, the reason is that [Nouri] al-Maliki [the Prime Minister of Iraq] is against it. So far there is nothing, there is no cooperation about anything and even no real dialogue. "The unity of Iraq is still a big hope possible to be realized. At the same time, we have to talk of a political process. First, The solution in Iraq must be based on the Arab Identity of Iraq, the Arab Iraq. Second, the assistance as to help in solving the Iraqi crisis should be an Arab one in essence before being a foreign one; the Arab countries should have a basic role. Third, the internal political process in Iraq should include all forces away from the US definitions…. Unfortunately, the Arab role is missing ; two years ago, there was a dialogue between us and several Arab countries concerned directly as to make an Arab initiative; we , however, have not found any response to this effort. Actually the role now is merely a Syrian one ; of course, there is a cooperation with the concerned countries, basically with Turkey and Iran as to preserve the unity of Iraq evading a destructive sedition, and to support at the same time the political process…. I think the current US Administration does not want from the countries neighboring Iraq to help Iraq. We have told the Iraqi officials that the more they are independent, the more Syria is to provide them support; I think that this pertains also to the neighboring countries of Iraq…. They- the Americans, have announced the so-called ‘ creative chaos’ ; we, Arabs, ourselves have not announced this. Consequently, we can say that what is happening is part of a scheme. Second, there are US writings and researches presented during the 1980th regarding the dismemberment of the region starting with Iraq . We judge things by realities, not by intentions; if their intention were to be good, and have destroyed Iraq and the region; can we speak of their intention as good! The issue is not that of a slap in the face , it is the issue of destroying the region which has millions of people. We can never judge intentions in such a case. The result is the destruction, division, sabotage and sedition." "So far we have received but the promises, nothing concrete ever. We fully shoulder all the burdens. Recently, I have heard a statement from the Iraqi premier that he was to provide small amounts : 18 million US Dollar to Syria, I think 12 million Dollar to Jordan and perhaps to other countries. 18 million US Dollar for who shelters hundreds of thousands are nothing. We provide of Fuel support only about a billion US Dollar for a million and a half of the Iraqis in Syria…. The Iraqi citizen now shares the Syrian citizen all the services. The sheltering of the Iraqi citizen in Syria , notwithstanding the economic burdens, provides Iraq a positive value as to enable the Iraqi citizen to live. We believe that our hosting of the Iraqi citizen is political before being an economic one." 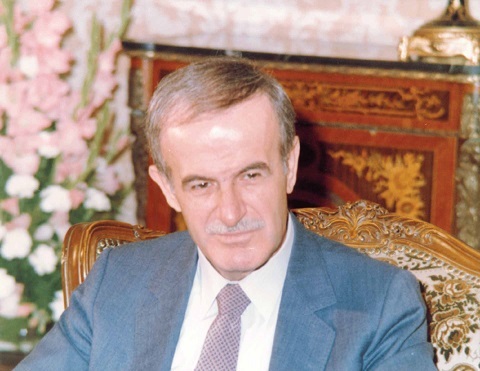 Regarding Iraq, H. E. President Al-Assad said there is “the inability of the occupation forces to provide the minimum limit of security”; reiterating the need for “national reconciliation”, on the basis of the dialogue among all its citizens, and a “timed-schedule for the withdrawal of occupation forces”, pledging continued support to “the Iraqi brotherly People”. "Syria was basically against the war and has always called in public for the departure of the occupying troops from Iraq. It's taken for granted that we offer any possible help for the departure of the occupation troops…or let's say to offer all facilities…because help could take other meanings…surely we are ready." 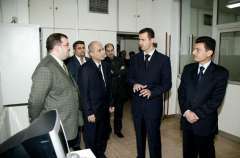 “This question was proposed to us in September 2004 during a visit of a US delegation to Syria, and we said that we do not oppose the signing of a Syrian-Iraqi-American agreement to control the border, but they left with no return, we tried to follow up the issue later, but we did not find any response. So it is not right that such an agreement was signed. We asked them to say what are the details of their demands on the border and we did not receive a reply at all. A part from the US interests, we have an interest in controlling the border and there is an old suffering on the Syrian-Iraqi border. But, as you know through the Syrian Turkish border, it is impossible to control the border one hundred percent. Moreover, the border can not be controlled from one side. As you said, Syria has taken measures, but if we look on the other side of the Iraqi border, we will find that there isn't any Iraqi or US measure. The Syrian-Turkish cooperation has made the Syrian-Turkish border controlled to a maximum level, despite the fact that they are longer than the border with Iraq and more complicated from the demographic and geographic sides. " “The border will not be controlled without cooperation, and I believe that there are some groups at the US administration that do not want Syrian cooperation in order to continue saying that Syria is not cooperating. This game has become crystal clear from our part, because they did not ask for any of these things, and because they are not compatible with our interests. On the contrary, we said we are enthusiastic about this cooperation. But they propose the idea and expect us to say No! When we say yes, they escape." “I wouldn't say this is true. It's completely wrong. You have an aspect of the problem. The first aspect is no country can control his borders completely. And example is the border between the United States and Mexico. And many American officials told me: "We cannot control our border with Mexico." But at the end, they end up saying: "You should control your border with Iraq." “The situation is bad in Iraq due to occupation. The Americans have begun to admit this fact. There is a great deal of chaos. What takes place in Iraq affects Syria in particular and other neighboring countries in general. The situation in Iraq makes terrorism stronger. The region has become a fertile environment to produce further terrorism. The Iraqi situation negatively affects the peace process. " "The United States has become a source of instability for the first time. "It is the chaos in Iraq. There are weapons being smuggled into Syria, and also the growing extremism and a feeling of hatred against the United States that have never existed before." "Each state has a special method of action. The federal system is a success in Germany. This might be a success in another form . There is somebody who put forward different forms of federation. Does federation means administrative decentralization, or form of decentralization. I warn that the danger lies in the fact that the federation is based on ethnic groups and communities . This thing is seen by us and by others as dangerous. Even the Iraqi people reject it through what we hear from the Iraqis themselves. This form of federation based on the ethnic groups and communities . This thing is seen by us and by others as dangerous. Even the Iraqi people reject it through what we hear from the Iraqis themselves. This form of federation that is based on the ethnic groups or community or on religion is a dangerous thing." "If the American forces withdraw without allowing the Iraqi people to draw a constitution and to elect their institutions, there would be problems. These occupation forces have responsibilities. The responsibility is to transfer authorities to the Iraqi people, so that they can choose their own future. Then, the withdrawal of these forces will be positive in all respects, for the Iraqi people and the Iraqi state." “You cannot implement the law one day and not the next. It is selectively implemented. This is what is happening now in the Security Council." The President said Iraq had been asked to accept the return of weapons inspectors and had done so. "Everybody is happy except the United States which is obstructing the return of inspectors." “Iraq is destroyed for the sake of UN resolutions and UN resolutions are destroyed for the sake of Israel."